Attacks and raids, feints, occupations, blockades and sieges. Warfare in Illyriad provides a range of tactical options, allowing for both considered planning and heroic action. Thirty two different military unit types are available to players as standard (8 per race), plus special units which can be won during play. Some are strong on specific terrains and each type excels in different terrain. A huge range of players' armies can be encountered during play: one player might have a mass of archers to defend his mountain home, backed up with Fire Elementals won during a tournament; another might build a huge regiment of heavy cavalry, devastating on the attack over plains; another might build a horde of cheaply equipped spearmen, seeing the cheap replacement of the troops as their main advantage; yet another might build several small, fast armies hoping to strike swiftly against isolated targets.... And these are simply the players' armies. 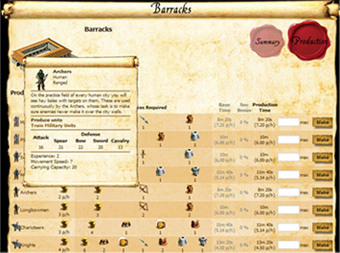 Non player armies also abound, with their own unit types, which may require different tactics to combat effectively. Each player may have five commanders per city. This allows for five armies to be sent out from each town with different orders at any time. But it also allows for further specialisation. Each commander may train up in dozens of skills, so that one commander might specialise in defending against different unit types, or might focus on leading cavalry charges, or might inspire his troops to march more swiftly, and so on. Opportunities for combat are plentiful, but rarely affect those who would rather remain aloof. Genuine conflicts do sometimes break out between Alliances of players, to defend territory or honour. Other conflicts are set up by Alliances by mutual agreement, as a form of sparring. There are also regular Tournaments, where players compete for prizes. And non-player armies frequently appear in the wilderness, bristling for a fight.